Who is Nichole? 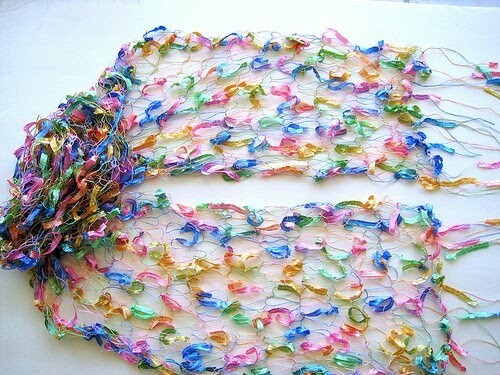 Well, she is one of the single most influential and inspiring crafters to me. She is someone who has helped me find and define my style and has shown me what to look for in a card. Her creations both as stamps sets and the cards and projects she makes with them never cease to amaze me. If I had one word to describe her it would be GENIUS! Many companies are trying to follow in her footsteps and be and do what she does, because she tends to set the trends. 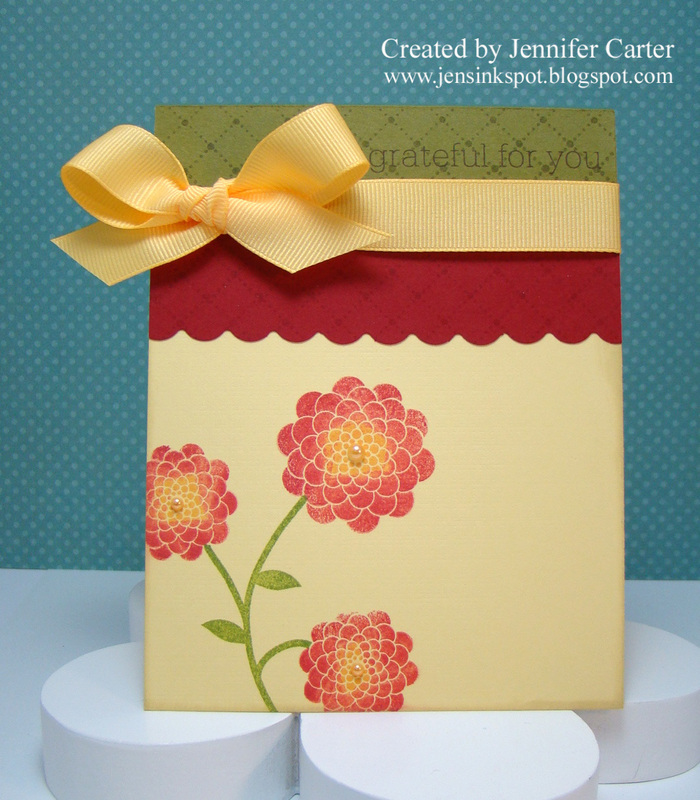 She is one of the owners of Papertrey Ink and this is a blog hop in her honor. A thank you for her inspiration and hard work. I wanted to make a card truly inspired by Nichole. I wanted simple but something that made a statement. I hope I achieved that. This layout is based on the Clean & Simple Sketch #104 that you can see here. Nichole, thank you for your hard work! Thank you for making me a better stamper! Thank you for providing the tools that you have that have truly changed and defined this industry! I am inspired by you constantly and am challenged as a paper crafter at the same time. I am very thankful to you for that! 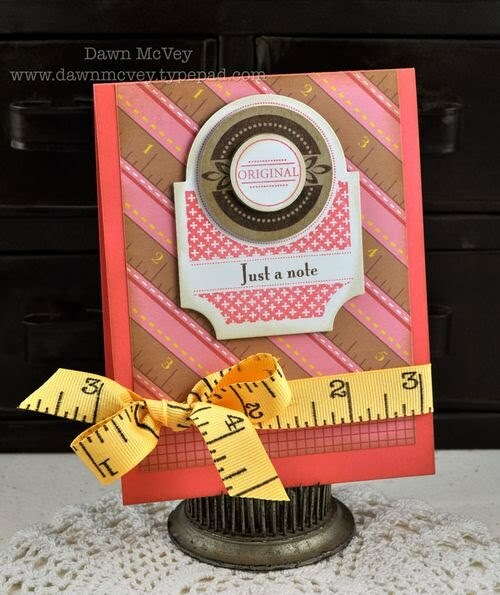 My friend Laurie of Soapbox Creations and I decided that since we like to make cards so much and we are both bad about sending them, we would challenge each other to send at least one out a week! So this card is made with that purpose in mind. And, we are doing a VERY mini blog hop together today to showcase our first cards (and we just happened to use the same sentiment)! This card is for a special friend of mine who is always such an encouragement to everyone around her. It is so wonderful to hear how the Lord is using her both in her personal life and in her work life. People are just so attracted to her because she is such a loving and warm person. I punched holes in the tree branch, knotted the twine and slipped it through the holes. Isn't that sentiment wonderful!! Oh my how I do love it!! Aren't these colors so wonderful together! I saw them featured on a challenge and remembered them. The challenge is called Color Cue by WPlus9. Thanks for stopping by!! 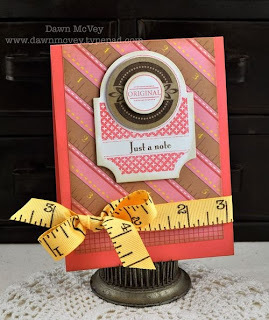 Be sure to visit Laurie's blog too and let her know how wonderfully beautiful her card is (and it IS gorgeous, just wait until you see it!!). 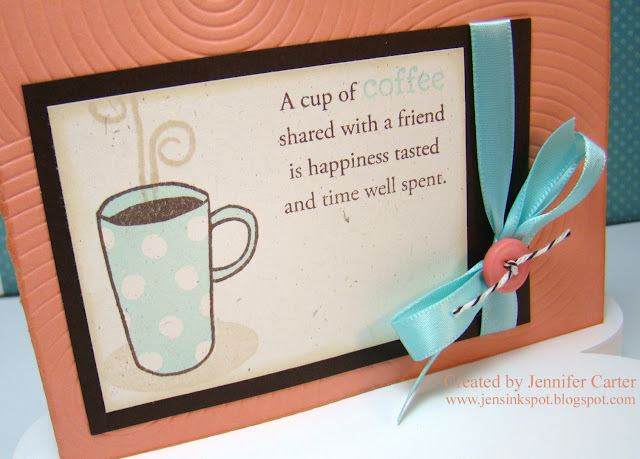 Welcome to the August Papertrey Ink blog hop! "In honor of school going back into session everywhere, we thought it would be fun to issue a Brown Bag Challenge. We want to see what you can do to dress up, alter, or change an ordinary brown lunch bag into a paper crafting work of art." I decided to make one of my most favorite things right now...banners! I see them everywhere (and am begging for PTI to make their own interchangable banner set!!)! I created this one with a birthday theme. While the party is going on it serves as a decoration but at the end of the party, each guest can take one part of the banner home with them simply by untying the ribbon that holds each piece together! How it is made: I took a brown paper bag and drew a triangle pattern with the point at the bottom of the bag. I then sewed each side with a sewing machine (I did not sew the top where it opens). Because the bottom of the bag was folded up, when I sewed it, it created a pocket which is where you see the Laffy Taffy/Tootsie Rolls. Also, since I didn't sew up the top part, it created a second pocket where I put the pixie sticks. I then attached the decorations (scallops at top & sides attached with strong tape/glue). And you can't have a birthday party without a card! 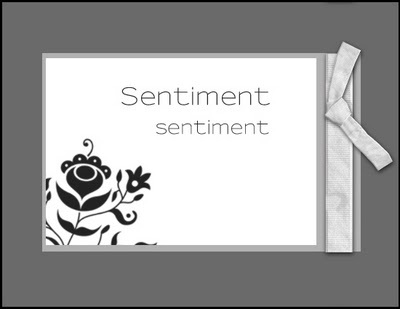 Here's the card I designed to match the banners. See that flower? It was made with a brown paper bag as well! Thank you SO much for stopping by! I'd love to hear what you think! Be sure to check out the other blog hop participants via the link on Nichole's blog! Blog posts can be added until 11:00 PM Central Time tonight so be sure to check for an updated list! Well, today is the fourth day of school for my son. What is that noise? Oh yeah, no screaming! LOL!! Our Ladies' Ministry Group at church gave a Visa gift card to each college student in our church and I made the cards...all 15 of them! There were 2 basic designs but all of them were slightly different based on where I stapled the tickets. I tried to keep them fairly simple but there ended up being a lot of pieces...which meant a lot of time but I enjoyed it. The star is popped up with a pop dot. Thanks for stopping by! I hope you'll enjoy your day! A few weeks ago I was at the grocery store and they had free bananas. They were pretty ripe and needed to be used right away. I decided that some banana bread sounded great so I picked up enough for a loaf for us and for some mini-loaves for the neighbors. At Christmas I had picked up some mini loaf pans on clearance at Michaels for 50 cents each! I hope they have them again this year because they are perfect! I bought the plain ones (white & red) so that I could decorate them myself and use them any time of the year and not just at Christmas time. So, when the bread was done, this is how I decorated up the gifts to take to the neighbors (I made 6 of these). I used some patterned paper that I've had in my stash for years. The tag was simple to make! The frame is from Fillable Frames #5. I stamped the outline image in a blue palette ink. The fun flowers are from the Boxes, Bags & Tag set and I stamped them in Champagne VersaMark ink. As you can see, I punched a hole in the bottom of each frame image and ran my ribbon through the hole so it would go behind the tag and then tied a bow at the top. I thought that these turned out pretty cute and the neighbors seemed to really enjoy receiving them (and eating them too)! I was told today that I am not updating my blog enough...so, I decided I had better get on the ball and do something about that! LOL!! I had a lot of fun coloring this flower (did I just say that??). I really, really like these purple copics. I think I am improving some on my coloring with them but still am learning how to use these things as I go. It's hard to tell, but I used the canvas impression plate on the kraft cardstock. It adds just a little depth and texture to the card. Also, I want to share with you a new addition to my Etsy shop. It is a mood ring! Remember those? Here are some pictures and you can read more about it at my Etsy shop. I have to say that I love flavored coffee drinks...even in the summer! It's a treat to get a Caramel Mocha Latte or a Milky Way Mocha every now and then (sometimes I do get them iced rather than hot). When I saw PTI's "Warm Happiness" set up for sale at a great price (it is a used set) and since I didn't place a PTI order this month, I knew I wanted to grab it up before it was gone! I'm so glad I did! When I first stamped this cute little polka dotted mug, I kid you not, I was giddy! It is so CUTE!! I know, I know, it is JUST a mug! But, it is a CUTE polka dotted mug!! Our church recently opened a small coffee shop in it and I thought that this set could come in very handy in the near future!! 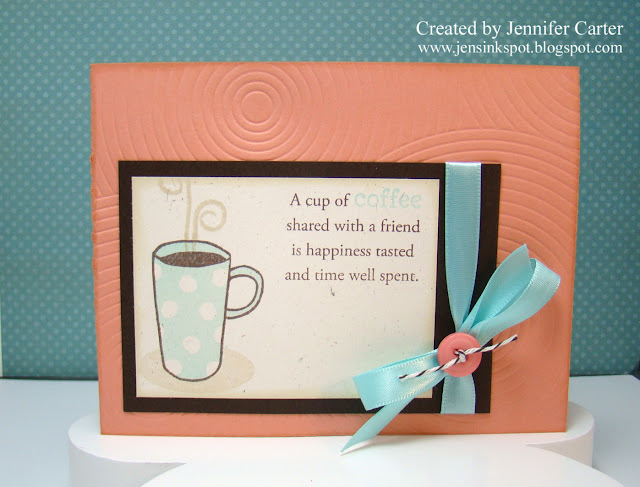 My card is based on a sketch from the Clean & Simple blog. It is sketch #103 and if you want to play along you can find the information here. Ted gave us a new challenge for August called "The Big Easy". He wanted us to create a one-layered card...NO ribbons, no glitter, no bling, etc. We could only use a base layer of cardstock and stamps/images and writing with markers, pencils, etc. When I read this challenge, I instantly knew what I wanted to do. This was my first try at drawing a box on my card, which I've wanted to do for a long, long time and I need to work on it a little to get it even. But, I do like the finished look it gives! 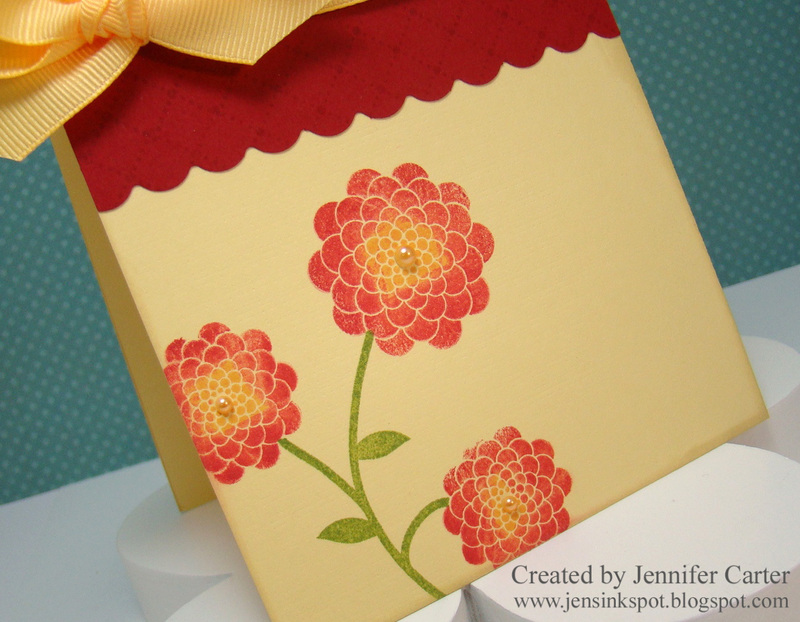 After I stamped the images, I added a little bit of depth to flowers by shading with my shimmer chalks. It's hard to tell in the photo but I added a little bit to each flower and to some of the leaves. I'm pretty sure that I followed the rules to the challenge, but I think that if I didn't that Ted of all people would understand, as he has laughed at himself several times lately over being "challenge" challenged! LOL!! Thanks Ted for hosting this fun challenge! New rings added to My Etsy shop today! 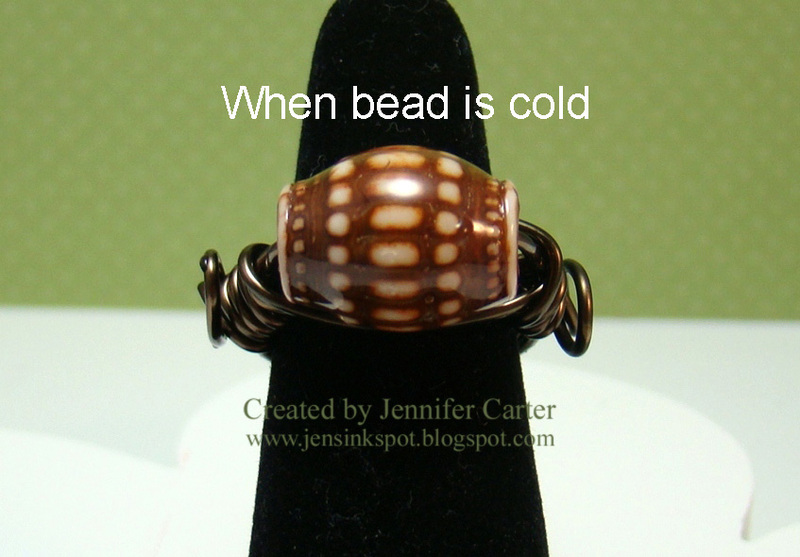 See all my rings at my Etsy store, Jen's Ink Spot here. School starts here next week and I'm looking forward to a good year for my soon to be 2nd grader! He will have a great teacher and I think we are all ready for school to start (whether he admits it or not). So, I decided to make a school themed card for the new Papertrey Paperdolls Challenge #17 hosted by Lisa V. The challenge she issued was to make a card based on Dawn McVey's card and to use any new products from last month's Papertrey release. It's hard to see but I used the Book Print Impression plate on the aqua piece and the canvas impression plate on the red scalloped piece. Thanks for stopping by! We'd love to have you join in and play with this challenge! Hello there! I just wanted to pop in with another quick post. I created a fun, fun ring that I had to share with you that I have for sale in my Etsy store! This ring really does jingle as you move your hand! It's not loud, but just a nice, soft jingle! How much fun would this ring be during the holidays or even on snow days! When you order, you have the choice if you want the matte finish (1st bell pictured) or the glossy finish (2nd bell pictured). The bells measure about 11/16" in diameter and about 9/16" high (off the top of your finger). My 2-year old daughter LOVES this ring so much and so I am going to find some smaller bells to make one just for her too! She is all girl, I just love it!! These bell rings are only $9 in my shop! You can view it here. If you'd like to see all the items I have in my shop, click here. Thanks for stopping by today!! The floral images on this card are from PTI's CHA set "Four of a Kind" that Lindsay was so wonderful to get for me! To say that I was beyond excited to have this set is to put it mildly! Thank you SO MUCH Lindsay!! It's been a while since I've made a circular card so it was fun to pull this one together...bright & bold for sure!! This is a new ring I just put up in my Esty shop today! Full of bling!! If you like Raspberry Fizz AND bling, you'll love this ring! It is made with a shank button that measures 1 1/8" in diameter. 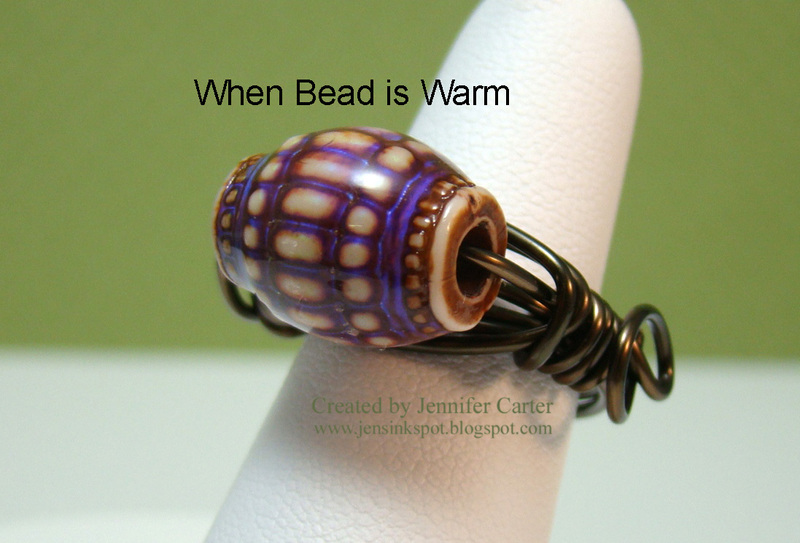 Check it out along with all of my rings at my Etsy shop, Jen's Ink Spot! Thanks for stopping by today! !